Critics say complexity of immigration law and rules makes Government's suggestion "absurd"
The Government faced criticism last week after saying that legal advice is not necessary for making immigration applications. 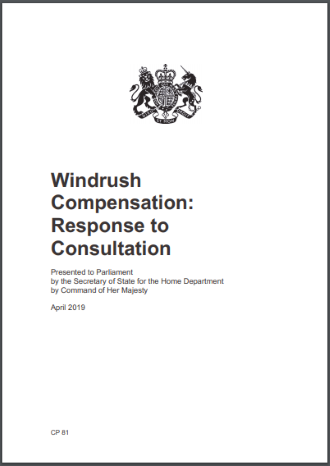 The comment was made in the Home Office's published response to a consultation held on Windrush compensation. Last Wednesday, the Home Secretary Sajid Javid announced the launch of the official Windrush Compensation Scheme, which he said was the latest step in the Government's commitment to right the wrongs experienced by the Windrush generation. According to the Press Association, the Home Office expects up to 15,000 eligible claims to be lodged, while Sajid Javid estimated approximately £200 million could be paid out. In its consultion response document outlining details of the scheme, the Home Office said, however, that it would only pay a limited, fixed contribution towards any legal advice fees incurred and it would not reimburse the full amount. The Home Office's consultation response stated: "The Government's position is that obtaining legal advice is not necessary in making an immigration application and that no advantage in the application process should accrue to people who choose to access, and are able to afford legal advice, over those who cannot." The Law Society Gazette drew attention to the quote in an article published on Thursday. In response, Garden Court barrister and Free Movement editor Colin Yeo said on Twitter that it was "utterly absurd" for the Government to suggest that legal advice is not needed for immigration applications. "They are so complex you are putting your head in the lion's mouth if you try it yourself these days," Yeo said. Yeo posted a number of quotes from judges complaining about the complexity of immigration law and the Immigration Rules, as featured in a January 2018 Free Movement article on the subject. For example, Yeo noted that in a 2015 judgment, Lord Justice Elias made the crucial point that ordinary people cannot possibly be expected to understand the rules as they stand. Elias stated in Iqbal & Ors  EWCA Civ 838: "I cannot, however, leave this judgment without observing how abstruse the law has become in this area. That is always a weakness but particularly so when so many immigrants are litigants in person with precious little, if any, understanding of English law … The overriding impression given is that the rules are changed in a piecemeal way to deal with particular problems as and when they arise. But firefighting is not the way to produce a rational or consistent set of rules; and the process does not sit easily with the rule of law, and in particular the principle that litigants should be able to discover the laws applicable to their circumstances." No 5 Chambers barrister S Chelvan recommended Colin Yeo's "very important" Twitter thread and called the Government's statement "utter nonsense". The campaign group Right to Remain said in a news release on Friday that the Government's position that legal advice is not needed for making immigration applications was "patently ridiculous". Right to Remain stated: "Immigration law is an incredibly fast-changing and complex area of law. Refusals of applications can result in family separation, human rights breaches, destitution, detention and removal from the UK (or refusal of entry in the first place)." Right to Remain said legal aid has been cut and successive changes to law and policy have made it much harder for people to meet the criteria for many applications, and there are far fewer legal channels for redress if an application is refused. The group added: "[U]nderstanding the asylum and immigration system, and your own legal case, is more important than ever. More and more people have no lawyer at all and are forced to navigate this very complicated system without legal representation. That's why, sadly, our work helping people to navigate the baffling, labyrinthine and often cruel procedures is more in demand than ever."